No, not the meat you find at the go-go bar. LOL I'm looking for a regular meat store. The kind of place where the meat is cut the way you like it, fresh, and they wrap it in butcher paper. Is there such a thing in the Udon-NongKhai area? 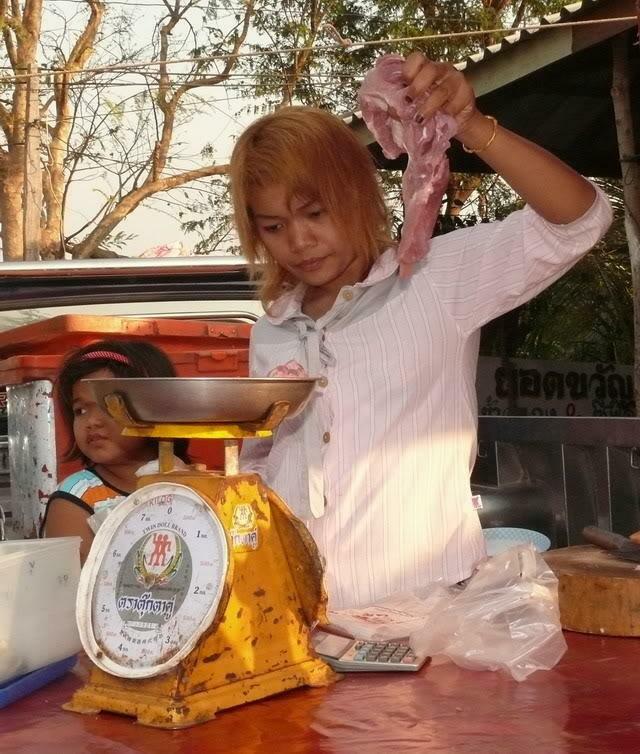 There's lots of butchers all over Thailand. If you like meat that's been left out in the sun all day covered in flies. I would think your best bet for fresh meat cut by a butcher would be the meat section of a Big C, Tesco or the like. Now you're talking. Northern Farms (Chiang Mai) brought me a huge leg of lamb a while back, I swear the fucker was still kicking. ^ They're a good crew. 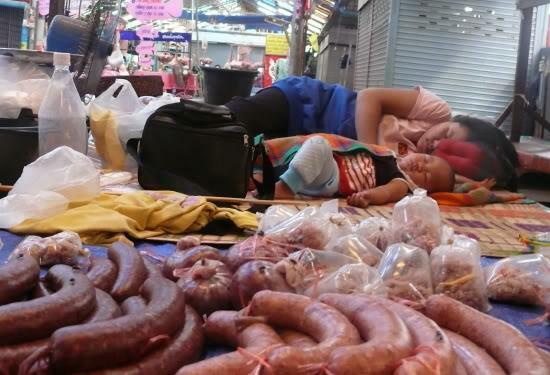 Best farang food suppliers in CM. LOL Harry. I broke a front tooth TRYING to eat a steak I bought at the market. I even beat the shite out of it with a meat terderizer hammer before I cooked it and didn't faze it. That's what I'm trying to avoid again. Oh man. Rub the flesh of a Kiwi fruit on tough meat and leave it to sit for 15-30 minutes. Best natural tenderiser there is. Really? I sure didn't know that. Thanks. In my twenty-two years in Australia, the popular Kiwi fruit which is a fuzzy brown egg-shaped fruit with a slightly tart green flesh and white pulp in the center has always been serve as part of a fruit platter or fresh fruit salad in a bowl. I did not know the "genuine wonders" of Kiwi fruit as a meat tenderiser until Christmas of 2008. My sister from Germany offered to oven bake with her own marinade the porterhouse steak. To my surprise, having bought a bottle of meat tenderiser, she opted to use the Kiwi fruit. Apparently, in Essen where she resides, the way she tenderises the steak is by mashing up the Kiwi fruit and blending it with her preferred marinade. I found the meat tasted better and tender with this little trick. Depending on the thickness of the meat cut, you can let it stand for half an hour before baking or pan-frying them. Be aware that the longer you marinade the meat in Kiwi fruit, the softer the meat will be. So, if Kiwi fruit is available in your country and you feel like having a steak tonight, why don't you try marinading it the Kiwi fruit way. I must admit, I never thought of putting it in the marinade as well. There is a god in heaven, he goes by the name of "harrybarracuda"
I am a benign deity keefus. Fresh beef is shite...Lamb too.It's got to be aged.Preferably in a chiller for a couple of weeks at least. Preferably in a chiller for a couple of weeks at least. Three or four weeks in 2 - 4°C is the best, I think. No problem hanging mutton or hogget, but not a lot of point in buying lamb if you don't want it fresh and bleeding after cooking. Will it not go bad in the refrigerator if not frozen? not because of the meat but because of the circonstances. Last edited by michaleo; 07-10-2011 at 03:17 PM. Sorry that the picture links didn't work. learned a nice trick lately about hanging meat in thailand buy your meat fresh from market then wrap it completely airtight in clingfilm must be really airtight then leave it in your fridge for 21 days should be well hung by then..
Is there such a thing in the Udon-NongKhai area? Chern Chim or Thai-French. Both in Udon.